Karen Haze, national and regional sales manager for Entercom Communications. 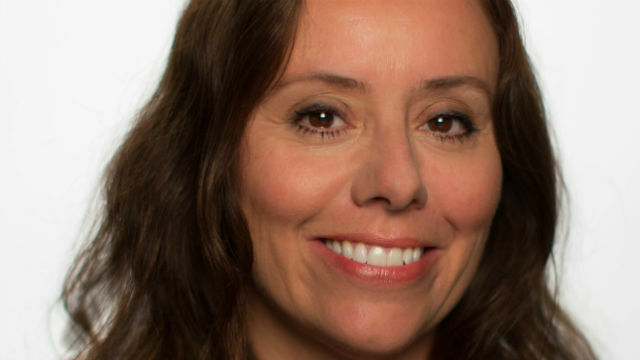 Entercom Communications San Diego has named Karen Haze as national and regional sales manager. She has more than 20 years of experience in radio sales. Haze was previously national sales manager for the past seven years at the two KFMB stations, KFMB 760-AM and KFMB 100.7 Jack FM. For the previous seven years, she worked as national sales manager and senior local account executive at KPRI-FM. Prior to KPRI, she worked with AMFM, Inc., a radio ownership group that grew from 42 to 243 stations before it was acquired in 1999 by Clear Channel Communications. She relocated to San Diego in 1991 and worked as promotions manager at XHRM-FM. Entercom Communications San Diego operates KSON 97.3-FM and 92.1-FM, KIFM Easy 98.1-FM and KBZT 94.9-FM. 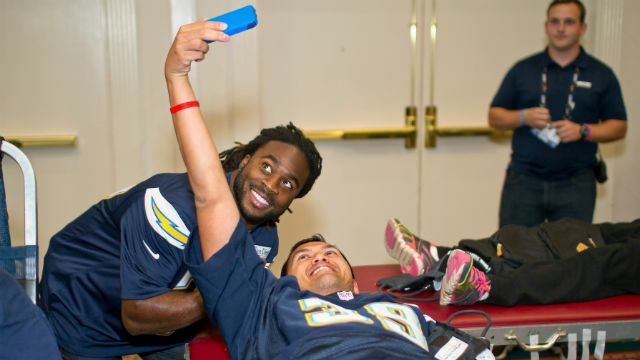 Chargers cornerback Jahleel Addae with donor at last year’s Chargers blood drive. The San Diego Blood Bank’s Chargers Drive XXXVII on Tuesday, Nov. 24, will draw appearances by 24 local radio stations with either a live remote or booth for giveaway prizes for blood donors. Presented by San Diego County Credit Union, the daylong community-wide blood drive will be held from 9 a.m. to 6 p.m. at the Town and Country Resort Hotel & Convention Center in Mission Valley. According to SDBB, the stations will include: Broadcast Company of the Americas’ XPRS-AM The Mighty 1090-AM, XPRS-FM 105.7 MAX-FM; iHeart Media San Diego’s KLSD/XTRA 1360-AM Fox Sports, KGB 101.5-FM, KSSX/KISS 95.7-FM, KOGO News Radio 600-AM, KIOZ Rock 105.3-FM; KMYI-FM Star 94.1, KHTS-FM Channel 933; CBS Radio’s KyXy 96.5-FM, KEGY Energy 103.7-FM; Local Media San Diego’s XHRM-FM Magic 92.5, XHTZ-FM Z-90 and XTRA-FM 91X; Midwest Television’s KFMB 760-AM and KFMB 100.7 Jack FM; Univision’s KLNV 106.5-FM, KLQV 102.9-FM Mas Variedad; Uniradio’s XHTY La Invasora 99.7-FM, XHFG Pulsar 107.3-FM; The Imagen Group’s XLTN Radio Latina 104.5-FM; Education Media Foundation’s K-LOVE KPRI 102.1-FM, Air1 96.1-FM, 101.1-FM; and, KGFN, Grossmont College’s student Internet radio station. Stations planning live remotes from the hotel include: The Mighty 1090-AM (noon to 6 p.m.); 105.7 MAX-FM (9 a.m. to 2 p.m.); XTRA 1360-AM Fox Sports (2 to 6 p.m.); KLNV 106.5-FM (2 to 7 p.m.); 102.9-FM Mas Variedad (2 to 7 p.m.); Pulsar 107.3-FM (10 a.m. to 2 p.m.). In addition to blood collection, the event will feature entertainment and autographs from Chargers players, NFL alumni and the Charger Girls. New this year will be the “Genome Zone,” an exhibit about DNA and genome sequencing presented by Illumina Inc. Considered one of the largest and longest-running single-day blood drives in the nation, the Chargers blood drive has collected more than 72,000 pints of blood over the past 36 years. This year’s collection goal is 1,200 pints. The Public Relations Society of America’s San Diego-Imperial Counties chapter will host “Research in Communications,” a program from 11:30 a.m. to 1 p.m., Thursday, Nov. 19, at My Office, 6060 Nancy Ridge DR., San Diego. Topics will include how to hire a research firm, how information is gathered by researchers and information researchers need to avoid misleading results. 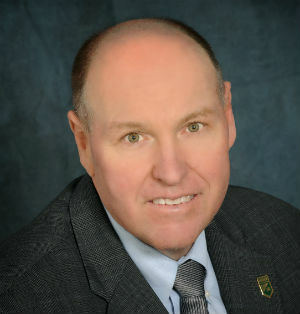 The speaker will be John Nienstedt, president/CEO, Competitive Edge Research & Communication. Cost to attend start at $30 for PRSA members and $45 for non members, which includes lunch. For more information and to RSVP, visitwww.prsasdic.org. Three media outlets, including Ranch & Coast Magazine, San Diego Business Journal and iHeart Media San Diego are among the sponsors of the National Multiple Sclerosis Society’s 29th annual MS Dinner Auction on Saturday, Nov. 21, at the Loews Coronado Bay Resort. Mitsubishi Motors North America, Inc. is the title sponsor of the fundraiser. Considered one of San Diego’s largest annual charity auctions, more than 600 people are expected to attend and bid on more than 700 silent and live auction items and packages valued at more than $500,000. The event typically raises about $450,000 for multiple sclerosis research and programs for people with MS, a chronic, unpredictable and disabling disease of the central nervous system with no known cause, cure or prevention. Tickets begin at $175 per person. For information, visit www.MSdinnerAuction.com.